Aetna Behavioral Health is offering its Resources For Living℠ (RFL) Employee Assistance Program resources to community members who have been affected by the earthquake, regardless of whether or not they are RFL customers. If a plan sponsor does have RFL, they can use their RFL-specific number. Other affected individuals can contact Aetna EAP at 833-327-AETNA (1-833-327-2386) for telephonic consultation to help cope with the emotional impact of this event. RFL’s professionals have experience dealing with traumatic events and can be available to provide specific interventions as needed. Employers in the community can receive additional support by calling 1-800-243-5240. Through this specialized phone line, RFL can provide management consultation services to help employers respond, even if they are not RFL customers. Onsite services are available on a fee-for-service basis for companies to help their employees deal with the impact of these events on the workplace. closer to home — like in your community — it may be even harder to process. several safety tips, recovery tips, and national resources available to you. • Listen to local officials for updates and instructions. Evacuate if necessary. • Check-in with family and friends by texting or using social media. • Return home only when authorities indicate it is safe. • Watch out for debris and downed power lines. down, and fast-moving water can sweep your vehicle away. • Photograph the damage to your property in order to assist in filing an insurance claim. 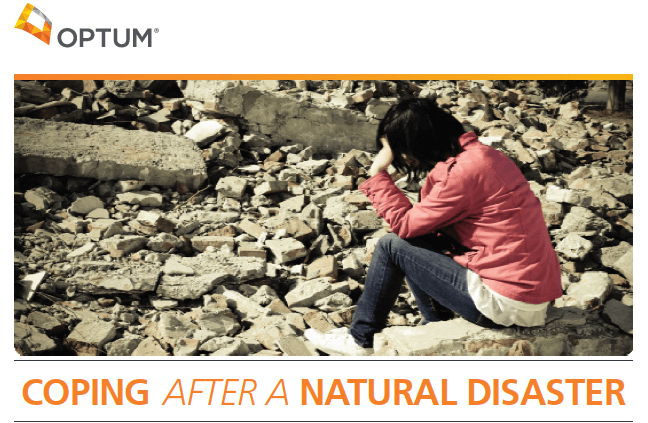 • Be prepared for the future with a disaster preparedness kit and family communication plan. health needs. Certain treatments may not be covered in some benefit plans.